So, I thought I would experiment to see if I could create my own version of this $800 Maxi Dress. Here is what I came up with. The following is the tutorial. Be aware this is pic heavy! I apologize for the horrible pictures, they were mostly taken in my basement with horrible lighting. 1. Take your 3 yards of fabric and wrap it around your body one and half times to determine your skirt width. For me, it was approximately the width of my fabric, so I did not need to make any cuts. Next, measure from just below your chest to the floor and use this as your skirt length measurement. 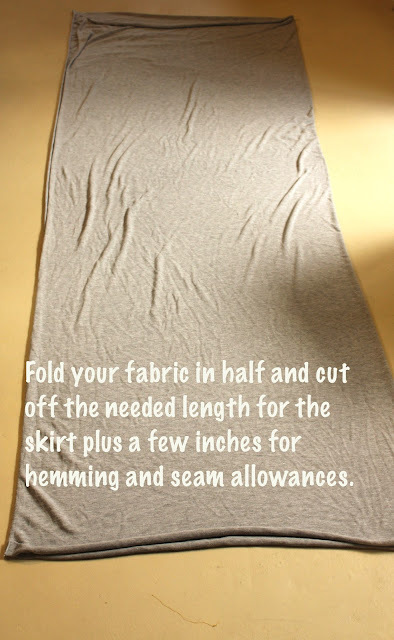 Cut your fabric to create a long rectangle using your skirt width by your skirt length measurements. 2. Since you will be adding pockets, you need to have a front and back piece to your skirt. **If you wanted to omit the pockets, simply sew a seam up the center back of the skirt piece. ** If you are adding pockets, simply cut down one long side of your fabric to create two equal rectangles (a front piece and a back piece). Then lay your skirt pieces to the side for now. 3. Take the bodice pattern pieces and cut out one bodice back on the fold and two bodice fronts. **My pattern pieces are for a size 4-6 for the top. ** Pin the bodice front to the back, right sides together, at the shoulder. Sew it together at the shoulders. 4. Press the shoulder seams open. Next, take the sleeve edge and create a finished edge by ironing 1/4 inch and then another 1/4 inch towards the wrong side. Edge stitch next to the ironed edge. Do the same thing for the front of the dress bodice, ironing all the way around the neckline. This is where you can opt to use a twin needle. It allows you to create two even lines of stitching on the front while making a small zig zag stitch on the back which allows the fabric to keep some stretch. The bodice is loose enough that you can stitch this with a straight stitch using a regular needle and will still be able to take the dress on and off easily. 5. Then pin the bodice right sides together under the armholes and stitch. Note that this will be a very small amount. 6. Next take your bodice and turn it right side out. Overlap the front bodice pieces, laying the right piece on top of the left and matching the center line. Pin the pieces together and baste. 7. Go back to your skirt pieces and sew the two skirt pieces right side together for about 5 inches down on each side starting at the top of the skirt. This will allow you to make your elastic casing and attach it to the top prior to determining where your pockets will go. It is now time to create the casing. Keeping the skirt inside out, take the top of your skirt and iron down a 1 inch hem all the way around the top. Then iron another 1 and 1/4 inch all the way around. Stitch next to the edge of the casing, leaving an opening for the elastic. 8. Then take the elastic and wrap it around your rib cage under your chest. Cut off the needed amount. Do not pull the elastic tight while measuring it. Thread your elastic through your casing using a safety pin. Once it is pulled through, overlap the two ends by about an inch and stitch them together. Then finish stitching around the casing edge to finish off where you had left it open to insert the elastic. 9. Attach the bodice to the skirt. First mark the front center of the skirt, back center of the skirt, and back center of the bodice with pins. Use these as guides when pinning the skirt and bodice together, lining up all pins and matching the center of the bodice front (where it overlaps) with the center front pin. Pin the right sides together and stitch. The easiest way to pin the two together is to have the skirt right side out and slide the bodice (inside out) over the skirt upside down. Stitch at the top of the elastic. When you sew the two parts together you need to pull and stretch the elastic quite a bit to get the skirt and bodice to fit together. If you find there is way too much fabric for you to pull, you can gather the top in places first. (You could gather it on the bottom of each bodice piece). 11. Finally, pin and hem your dress to the desired length. Very nice--I prefer yours to the $800- version! That looks GREAT on you! Of course it does! Good job! I love it! I've got a lot of fabric in my stash, and this would be the perfect way to use some of it up. I am loving that denim jacket with it. I'd love for you to link it up to Crafty Cousins. Thank you so much for stopping by and for following! That looks fantastic! So classy, even if it is knit. I just tried downloading the pattern pieces, but it says I don't have permission to access the files. Help? Really, really pretty! I love it! Thank you Shannon, we appreciate you stopping by the blog! It turned out great! And I love how detailed your tutorial was. Thank you Lindsey. We appreciate you stopping by the blog. Love it and pinned it!! I love the simplicity of this with the jean jacket. Clothing design has always been one of my loves too. Hope you're having a great weekend! I'm pinning this! Thanks for stopping by Melissa...I hope you get the sewing machine for Mother's Day- how fun! I love the dress, however I would put in seam pockets in before elastic I would be much easier. I always use in seam pockets as I love them. I use on pants with or with out elastic waist and works best to put them in seam before waist like is finished. This is great, and is even do-able in a plus size. Thanks for sharing! I can't open the pattern, is there any other way to get it? Awesome dress, I was actually trying to find a way to modify a pattern I have for a maxi dress that requires a zipper to using elastic and I think I can use this. My question is, when you're attaching the bodice to the skirt, are you sewing through the elastic, or are you sewing just above it? Not sure if my first comment worked. I love your dress and I was trying to find a pattern with an elastic waist so I could modify a pattern I have that calls for a zipper. I"m just unclear on when you attach the bodice to the skirt, are you sewing through the elastic as you stretch it, or just above it? Thank you so much for this tutorial!!! And thank you for letting us know what type of fabric you used!!! So many don't!!! I think this is a wonderful tutorial, thank you for sharing! Did you create the bodice pattern yourself or modify it from an existing pattern? Also, do you think it would work to sew the bodice to the skirt before inserting the elastic into the casing? I am attempting to teach myself to sew. I really want to be able to make my own maxi skirts & dresses however I only have a traditional machine rather than a serger. Do you use a traditional or a serger? If you do use a serger, have you had any luck using a traditional machine?